p. 29 left: Marcella (Libbey) not “Pentagon”; source: ACGA Libbey composite catalog (1996). p. 53 lower right: Mirror Block (Mt. Washington), neither Block Diamond nor “Cushion”. The former is the official name of a pattern very similar to Mirror Block; the latter is the name assigned by Revi. Source: pat. no. 18,959 and Crockery and Glass Journal, issue of 2 May 1889.
p. 54 lower right: Hortensia (Mt. Washington), not “Daisy”; source: CMG f-2981 (c1893). p. 55 right: Magnolia (Mt. Washington), not “Fan and Diamond”; source: CMG f-2976 (c1894). p. 56 left: Admiral (Pairpoint), not “Ox-bow”; source: CMG f-2976 (c1894). p. 57 left: Cambridge (Pairpoint), not “Bull’s-eye”; source: ACGA Pairpoint composite catalog . p. 58 left: Holland (Pairpoint), not “Tulip”; source: ACGA Pairpoint composite catalog . p. 178: Russian-Persian, not Persian; see the russian3.htm file (Persian) in Part 1. Persian is a non-patented pattern. The ACGA correction sheets, together with the above additions, also apply to a reprinting of Revi’s 1965 book that was re-published in 2000 by Schiffer Publishing Ltd. with the title ENCYCLOPEDIA OF AMERICAN CUT AND ENGRAVED GLASS. In this “new” book Revi often ignores official factory pattern names that have been discovered since 1965, preferring instead to use unofficial names that he himself “coined” thirty-five years ago. Although he does provide official names in some instances, they are always accompanied by “coined” names, and the reader is not told which is which! A “coined,” or assigned, name is never appropriate once a pattern’s official (factory) name is known. 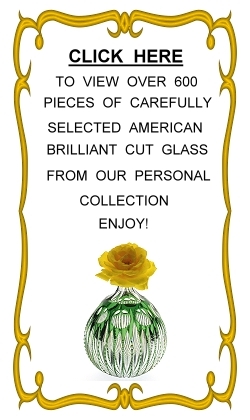 Cut-glass design patents granted during the period 1875-1920 that are NOT included in Revi’s book. All patents were assigned by their patentees to the patentees’ companies except those marked with an asterisk (*). These were retained by the patentees.